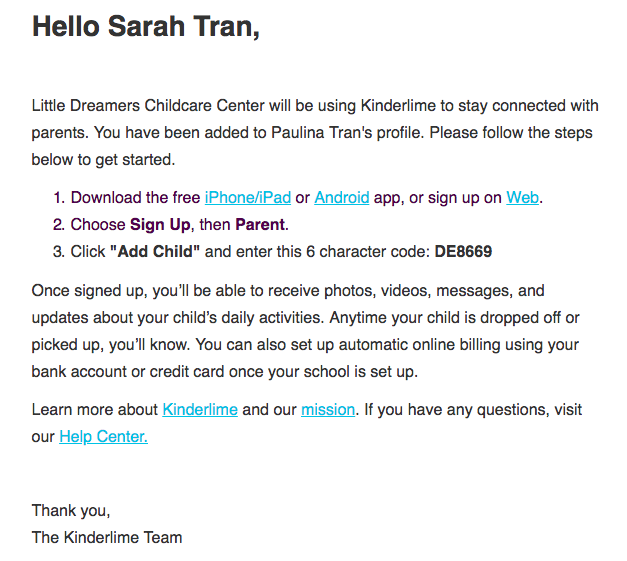 All of the instructions you need to sign up for a Kinderlime account are in this email. Please read steps 1-3 very carefully. You can set up your account from www.kinderlime.com by clicking on the "Sign Up" button in the upper right, then proceeding to create a parent account. The invitation code in the email above should only be entered after you have created your account and logged into Kinderlime. You will see a prompt to enter the code and Add Child. 1. Do not try to log into the Kinderlime using your email address and the invitation code. You will receive an error that your email is invalid. 2. If you have already created an account with Kinderlime, then you should be able to log in directly with your email and password, or reset your password if you do not know it. 3. If your email does not look like the above picture, and you're receiving an invalid email message when trying to sign up, please download the Kinderlime Parent app instead. You'll know that you need to use the Parent app if the website has a green navigation menu along the top (as opposed to a blue menu along the lefthand side).